My first exposure to APRS (Automatic Position Reporting System) involved configuring my home VHF station to send periodic weather data to the APRS weather servers. My station configuration includes a Peet Bros. Ultimeter 2100 home weather station, a Kantronics KPC 3+ TNC, and an ICOM IC-910 all mode transceiver. The 2100 can be configured to send formatted 'records' out an RS232 serial port at 2400 baud. Of the many record formats available, two of them are APRS compatible: the Packet Mode record (Table 1) and the Data Logger record (Table 2). I am using the Data Logger record primarily because the fast update rate allows the system to send the most timely weather data independent of the VHF transmission rate. The serial stream of weather records is routed to the TNC via the GPS input port. The TNC reads each data record and is configured to periodically transmit this data via a VHF radio link. The VHF radio link in my area is one or two digipeater hops to a station with an Internet Gateway to the APRS servers. The RF method requires a dedicated TNC and VHF radio to implement. Uploading weather data to the APRS system via the RF link works just fine as long as the RF path is good and all stations are up and running. The same weather data could be formatted and delivered direct to the APRS weather servers -- without tying up a TNC and radio -- by using a computer and available software to collect, format, and periodically upload the data to the servers. The 'direct to internet' project was conceived when I wanted to participate in the Citizen Weather Observer Program (CWOP) and not tie up a computer and/or a radio/TNC setup. My initial objective was to use a PIC microprocessor to condition the data from the 2100 weather station, then add the APRS header and telnet the data to the WX server. The device I chose to interface to the internet is a Siteplayer Ethernet to RS232 adapter. 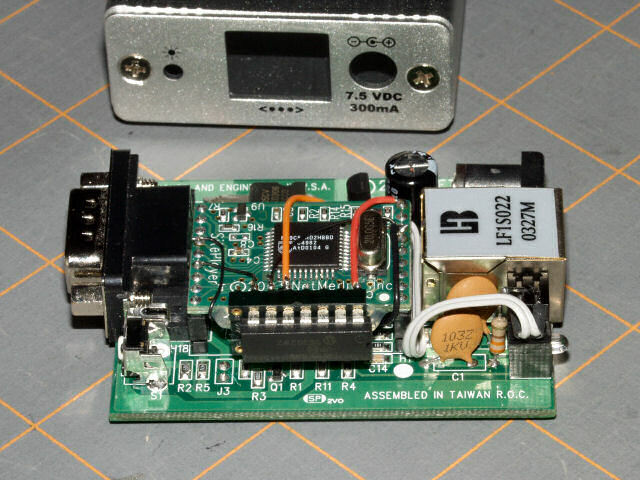 Once I had the device in hand I realized it would be much easier to insert the PIC processor into the adapter module; this saved the expense of extra interface circuitry, a power supply, etc. The modifications to the SitePlayer include breaking the serial data and control lines between the RS232 level converter and the adapter processor, wiring the PIC processor between these lines and supplying power to the PIC. Additional functionality could include the ability to modify user-specific information such as ID/callsign info, routing information, status message content, upload intervals, etc., without a PIC programmer. The Packet Mode ($ULTM) record output rate is once every five minutes. The Data Logger (!!) record output rate is approximately 175 records per minute. To view the current data stream visit APRS WX Data from station WD7K-4. Click on the 'Raw APRS Data' link in the left sidebar to view the nine minute data packets.